I discovered how to do this by accident, involving dropping a log, having a glass pane in the hot bar and hitting the wrong key when I sized the glass-entirely by accident. Excuse the quality of screen shots as it is very difficult to get a good shot of glass. 1. Place a glass pane on your bar, for example on space 2. Put it on your cursor, so that you can see it on screen. 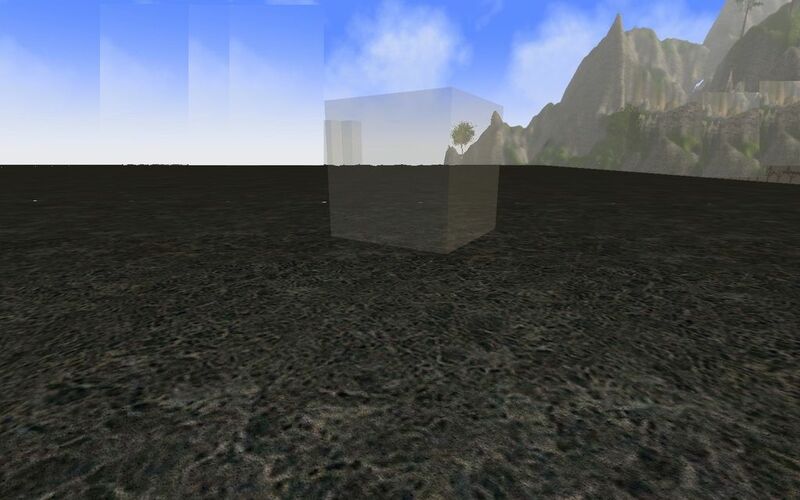 There are 3 types of glass, use them to get different appearing texture results. 2. Type the tilde key (~) to bring down your console menu, as shown here. 3. You are going to use the size command, size x y z , to make a block or plank. 4. Type this into the console window: size 1 1 1. Close the console window. Note that if using less than whole numbers, you MUST type it as 0.5, not as .5, always use a zero before the decimal pt. This is the console menu at the top of your screen, when it is in the open position. 5. Set down the new glass block, as shown. It is a 1 x 1 x 1 glass block that you can build with. 6. 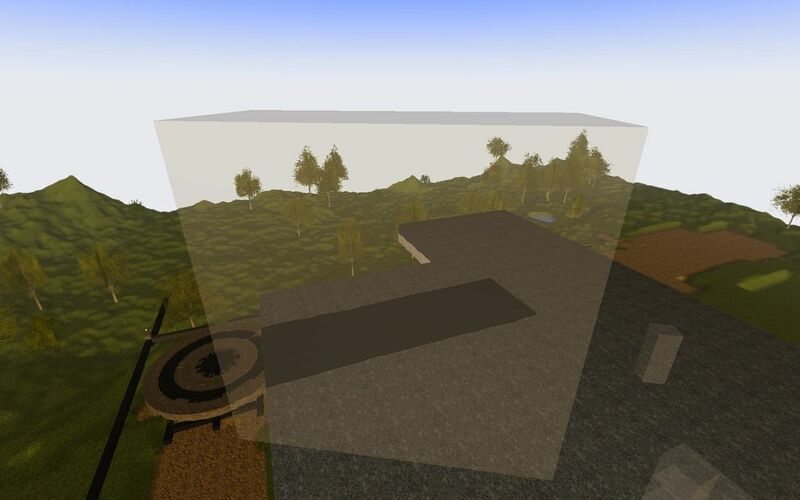 To work with the glass block, you will find that it acts the same way as a wooden block: you can rotate it, change the length, width, and depth using the arrow commands: exactly as you would do with a wooden block. If you do not know these commands: hold a plank in your hand and click on F1. 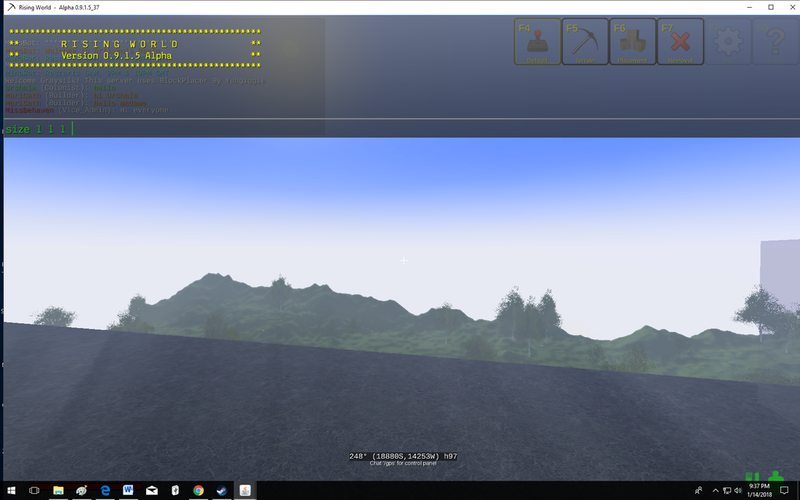 This will bring up the extended construction menu and show you many excellent building commands. Rotating the block: you can’t see part of it as the transparent parts make for odd screen shots. 7. 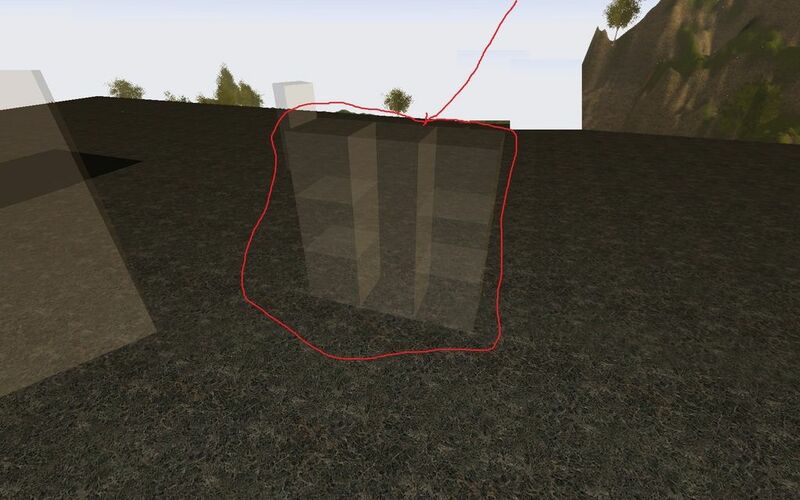 Using the glass block, build a glass wall, you will get this result. You will now have a 5 by 1 by 5 clear glass wall. See example here. 9. You may use the arrow keys to make a plank using the same block you have been working with, or you may use a different glass pane. In other words, switching back and forth with the size command, using the same one block to switch between a block/plank. Or, you may make a separate block and a separate plank, this is the method I prefer to use. 10. Using a new glass pane and the size command, create a plank, sized as needed. Ex: 5 lg. x 0.5 deep x 1 wide. Experiment to see what you can get. I like to keep a block, and a plank on hand to use without resizing one pane back and forth. Note that when you look at your inventory, you will not be able to tell them apart by looking at them. The glass block and the glass plank will look the same. The only way to tell them apart is to know where you set them in inventory, and/or to actually place them as building. Note: you have to have creative control to use these commands in the console. Survival servers likely will not allow you to do this. Each server has its own sets of rules according to the admin. of that server. If you are playing on a ranked server, you have to play a certain number of days to access different ranks, which will award different building commands. If you play on a survival server, or a restricted server, you can practice these commands on your own single player server if you wish. Just be sure to make your personal server in Creative Mode. This is not really an "accident". This is a result of the new size command added with the last update. Jon_Miner, the size command was no accident true. However, finding out how to make the blocks from an element that has no I. D. number was an accident. I have used the' item etc no. I.d.' to summon building blocks of diff. mat'l. until the size command was given us. I was playing with the size command - first time use. If I had not been holding a glass pane next to a board, and hit the wrong hot key, I don't think I'd have used the pane on purpose. I meant that using the pane was an accident, resulting in a glass block. I was pretty excited about it, as were a few others in our chat on DS that night. A lot of ideas of how to use glass in all sorts of nifty ways were discussed. I hadn't seen anything about working with it on any of the chats before this. So I posted it. The post was edited 2 times, last by Graysilk13 ( Jan 16th 2018, 7:09am ). That is awesome news. I didn't know about glass block's. I used glass pane for a wall once. Big thanks for explaining how to get these into glass blocks. Now we just need to figure out how to get a glass log. Do you know how to make glass triangles? This is not possible, till now. Habe deine Entdeckung Glasbausteine ausprobiert. Voll Genial . Super .